I have a feeling this new column on Mason Dixon Knitting is going to dictate the direction of my wish list for a time, but this first one is especially appealing: knitting, spinning, Scotland, socks! Yes, Please! (Though you’ll find me in a B&B rather than a tent in a cow pasture). 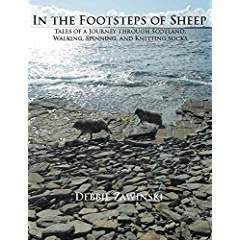 Debbie Zawinski’s In the Footsteps of Sheep reviewed by Franklin Habit.